The balance bb is at approximately 6:00. Now I see the bb, thanks. Does this rim look like it ever had a tire mounted on it or secured in a trunk? Keep in mind, just because it "could have" happened does not mean it ever did. Even if it really did happen, the normative practice standard is hard to get over considering that you may never be able to document it. It would be "technically incorrect" and the wheel would need to be painted per normative practice in order to be "correct". In the "restore it first" world we live in, I think there are many cars that get restored/over restored, (perhaps with good intentions), but when more information has come forward, some of those original cues and quirks have been "restored" right out of the hobby, all in the name of correctness, and because a guy doesn't want to be looked down on because his car appears different than what most people/judges see. Doesn't change - the wheels were done as a set. One set of YH, one set of FC, then XT, etc. All get painted matching and get matching tires. You're suggesting that every 5th wheel would have to come from a different pile of parts (only on YH wheels) and they wouldn't paint that wheel? If they all came from the same pile, then why paint different? The spare was designed to rotate into usage. No way would they make it so the customer couldn't rotate his tires. Any possibility of dealers replacing stolen wheels with service replacements on new cars? Or service departments "borrowing" a wheel and replacing with a service wheel? Absolutely. Hi-Perf cars were regular targets for thieves back in the day. There was an interview in one of the mags with a guy that worked at Gibb Chev; the ZL1s had carbs stolen right on the lot. A dealer in Detroit had 5 ZL1 Camaros stolen one evening. Dealers regularly swapped wheels around. Someone posted paperwork from their Z/28 sometime back. Very likely they swapped wheels between two cars in stock. Could the car been equipped with a doughnut tire and asked the dealership to install a full spare? Not an option with a Z - N65 was n/a. As noted the wheel does have the BB, and yes Steve, it did appear to have tire bead marks from a tire being mounted at one point? I say did...as I have now restored the wheel to "normative practice" along with 4 other wheels. I get what your saying Kurt, but as William stated, if parts were needed from stores, they could have been taken due to a shortage and ended up on, or in a car. Having adopted the CRG normative practice and sometimes over restoring, this wheel will no longer be a possible straggler as it is now black and silver. One point to note, all of my other 4 wheels before being restored were spun and trued up. When it came to balancing the new bias ply tires, all required significant weight...except for the one that was the claimed original spare. It spun perfect on the road force balancer and was noticeably better than the other 4 which had all been recently trued? Go figure. Wheels were then fit with a non factory tire of my choice and placed on the car to get it as a roller for moving around. Today they will be replaced with a set of Day II Cragar's and will go into storage along with a full set of NOS derby caps and 4 clip trim rings. I'm sure they'll be seen again someday? 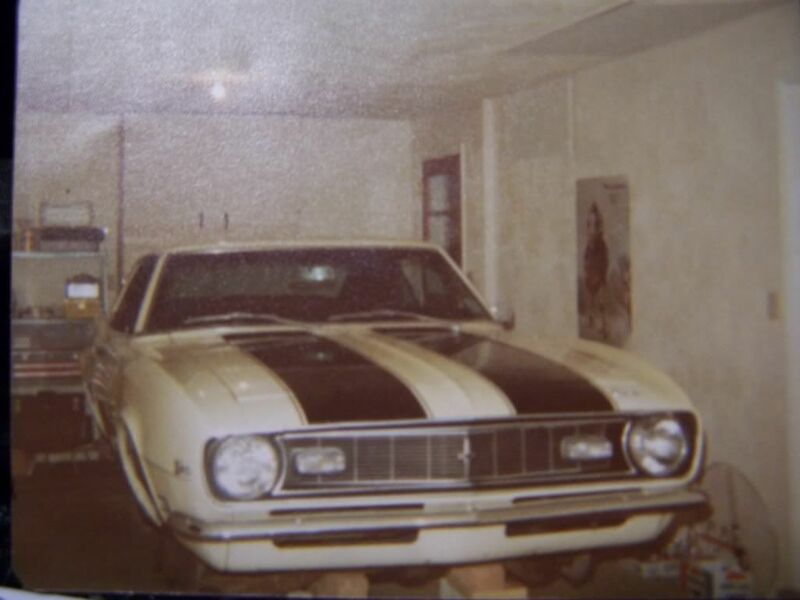 Your comment Bill brought back memories from our Railroad Yard back in the day as cars came in on railroad cars and lots of stuff was stolen especially batteries. On another note.....I am curious if the green '69 pictured is stored long term like that on jacks. Isn't that bad for the rear spring front bushings and front upper and lower control arm bushings that otherwise had their bolts tightened with the weight of the car? When I was young (almost 50 yrs ago?).. I heard stories about thieves hopping the trains carrying new cars, and dropping out Muncies.. they would then push them off the train when the train slowed and afterwards go back and pick up the transmissions... I wonder how many Camaros ended up with the WRONG transmissions at initial sale time due to crap like this?? Car is never stored on jacks. It was only up because I was switching wheels around and test fitting different wheel combo's. Car now has it's Day II wheels on it and is back on the ground. When I store things long term, I always put the tires onto contoured car dollies or foam pads to keep from flat spotting the tires. Possible. I have never heard of that. Might cause damage dropping a trans off a train. Carbs, distributors, alternators, wheels would have probably be more likely targets.